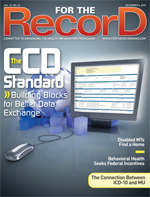 Should the conversion to ICD-10 be included in the meaningful use requirements? It’s too late for phase 1, but the code set could very well be a factor down the road. In the long run, perhaps it would have made sense for the authors of the meaningful use requirements to include stipulations about ICD-10 conversion. How practical such a strategy would have been is open to debate. Now that healthcare organizations are in the midst of targeting meaningful use goals and transitioning to ICD-10, it’s easy to understand why it will be difficult to accomplish both in relatively the same time period. But if they were somehow connected, perhaps the task would have been less strenuous. ICD-9, long rumored to be headed for retirement in the United States, will finally be laid to rest by 2013, replaced by ICD-10, a more robust cousin that dives into more detail in an effort to garner discrete data with the hope of improving care processes. Regardless of whether it’s actually part of the criteria, the information gathered from ICD-10 patient encounters could be useful in a meaningful use environment. CodeRyte CEO Andy Kapit says there’s definitely a relationship between the two initiatives. “The federal government set a low bar in order to make technology ‘meaningful.’ ICD-10’s premise is that we are going to get granular information that will improve healthcare at the public and individual level. Isn’t that truly meaningful then? The better the quality, the better decisions one makes,” he says. It raises the question about whether ICD-10 will be used to capture health information or will be like ICD-9, which drives reimbursements. In that case, is it really meaningful information that’s being captured? The adage “garbage in, garbage out” applies to healthcare data. If the goal is to capture rich data that can enhance decision making, which in turn can lead to more efficient and more appropriate care, then the initial data must be of the highest quality. “By definition, anything that allows for the capture of more accessible and actionable information is meaningful then, correct?” Kapit says. Mansoor Khan, CEO of DiagnosisONE, echoes Kapit’s thoughts in that the real benefit of ICD-10 is in allowing both billing and care to be described and managed at a more granular level. “While most of the discussion around ICD-10 has been around administrative processes, the real benefit will be realized in improved quality of care through the availability of more granular information for the implementation of robust, patient-specific clinical decision support,” he says. Erica Drazen, managing partner of emerging practice at CSC, says it makes sense to tackle ICD-10 and meaningful use projects at the same time for any new applications a healthcare organization is building. “The redo is complicated because staffing is short with so much to do. Practically speaking, it will be a ‘just-in-time’ redo,” she says. ICD-10 would have been included in meaningful use only through standards requirements, Drazen says. “And to require everyone to be at ICD-10 by 2011 to qualify for meaningful use incentives would have been very disruptive. Certainly, there’s nothing in the standards that precludes an organization from adopting ICD-10 sooner because you can use a more advanced iteration of the standard,” she says. Whenever the implementation occurs, don’t expect an immediate change in physician behavior, Drazen cautions. “The physician may write a diagnosis and it will be translated by the billing clerks. That’s one workaround that might be used. It’s not by any means meeting the intent of meaningful use nor is it efficient, but it might be a workaround to get the bill out,” she explains. Sabharwal says providers know ICD-10 and meaningful use are huge undertakings, but it could be shortsighted to view them as separate from one another. “You can possibly merge these two initiatives into a single, slightly larger initiative and achieve them at a lower cost than if you do them separately,” he says. Jonathan Elion, MD, founder of ChartWise Medical Systems, says just because a healthcare organization meets meaningful use criteria doesn’t necessarily mean the technology is making a difference. “I don’t mean this as a criticism of meaningful use because I think it’s a spectacular stimulus to the creation, application, and use of critical technology, but nobody said it had to be good use,” he says.